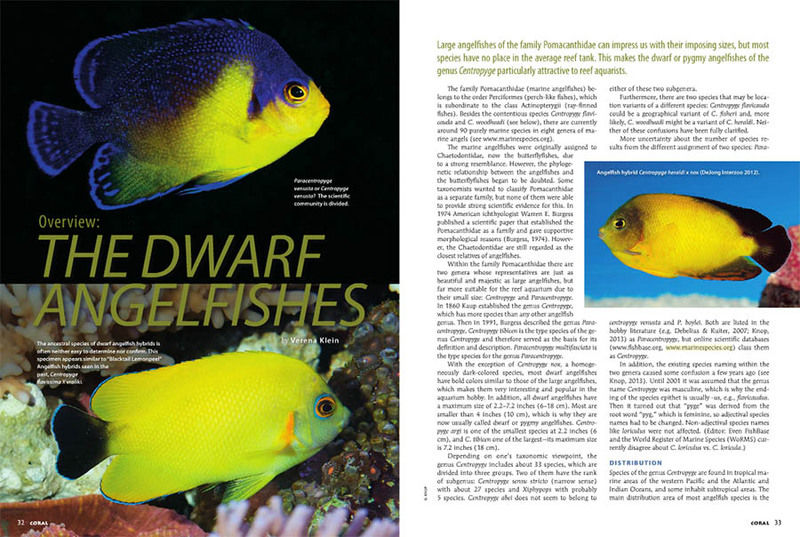 The opening spread of Verena Klein’s article, “Overview: The Dwarf Angelfishes”, appearing in the March/April 2015 issue of CORAL Magazine. The editorial staff at CORAL Magazine regrets to note a few errors discovered in Overview: The Dwarf Angelfishes, by Verena Klein. These errors were discovered during our editorial review process, but somehow slipped through the cracks and were not corrected before the March/April 2015 issue was sent to our printers. We were surprised when print copies showed up, and we discovered the following errors remained. These errors are being corrected in our digital edition, and we regret any confusion these errors may cause. The ancestral species of dwarf angelfish hybrids is often neither easy to determine nor confirm. This specimen appears similar to “Blacktail Lemonpeel” Angelfish hybrids seen in the past, Centropyge (flavissima X vrolikii). Depending on one’s taxonomic viewpoint, the genus Centropyge includes about 33 species, which are divided into three groups. Two of them have the rank of subgenus: Centropyge sensu stricto (narrow sense) with about 27 species and Xiphypops with probably 5 species. Centropyge abei does not seem to belong to either of these two subgenera. Compared with Centropyge flavissma on page 34, this specimen shows signs of possible hybrid influence of C. vrolikii (at right). Additionally, Sr. Editor Matt Pedersen noted inconsistencies in the spelling of the scientific name for the Pearlscale Angelfish, Centropyge vrolikii (syn. C. vroliki). In two articles Pedersen contributed to, he used the spelling of C. vroliki (eg. page 31, page 53 caption), whereas in our other articles (and even in Pedersen’s texts), the spelling of vrolikii remained unchallenged by Pedersen during our editorial process. Fishbase and WoRMS both cite vrolikii as the correct spelling of the species name, making vroliki a synonym. However, it should be noted that the spelling (or misspelling) as C. vroliki is very widespread and prevalent to this day online, being used by many generally well respected sources. A quick check of texts reveals the spelling as recently as 1998 in Angelfishes & Butterflyfishes by Gerald R. Allen, Roger Steene and Mark Allen. This said, CORAL Magazine usually abides by the current taxonomic ranks and spellings as outlined in Fishbase, and editorially Centropyge vrolikii is therefore considered the proper spelling at this time (and Pedersen chuckles when he says “Darnit, I should have checked this one against Fishbase!”). Notice any other mistakes? If so, never hesitate to email us about them or comment about them on our website.